In the digital age, the number of opportunities available to businesses is greater than ever because ubiquitous connectivity means the world is at your fingertips. So your customers can be almost anywhere! The only barrier to opportunities becoming realities is your ability to communicate and compete in new markets. Whether it be a large or small business or technology start-up, there comes a time when every business must expand its market in order to maintain growth and continue to gain market share. If you’re a local business delivering local services, you’re looking to grow into other cities or nationwide. But if your business is already reaching its full potential nationally, then businesses will generally look to expand internationally. Canada’s proximity to the United States with most of the population close to the U.S. border and connected USA and Canadian highway and rail systems, means that servicing the new market may not even require warehouses or other “in-house” business services – because these can be provided by your current infrastructure and charged back to the Canadian branch office. All major transportation systems in Canada and the USA are naturally connected because of the cross-border traffic and the amount of goods and services bought and sold between the two countries. Other than rural Quebec and a few isolated regions in the Atlantic Provinces where French is the main language spoken, most Canadians speak English or are bilingual. The U.S. and Canada also have very similar legal systems. For the most part, Canadian and American consumers are very similar. So the changes needed to the business culture of the branch office and the way products are presented are less problematic than when you expand into markets with divergent cultures and different languages. Canadian consumer incomes and spending habits are more similar to those of U.S. consumers than almost any other country because of similarities in culture and values. Often, international expansion is not successful because the business did not understand how to market to consumers who are motivated by different purchasing values held by local consumers. The similarities between Canadian and U.S. consumers can provide insights into new products, improving current products or finding new uses for your products. Canadians also want more options and brands to choose from. Due to cross-border media broadcasting and large portions of the Canadian population living in close proximity to the U.S., there is more awareness of American brands in Canada. Canada’s currency is heavily influenced by the price of oil, so now and for some time in the future, you’re investing of U.S. dollars is worth considerably more than their face value in your new Canadian market. You could also buy any equipment required for expansion in the U.S. at better prices herein Canada. In many industries, Canadian workers do not receive as much pay, so there is an opportunity to hire knowledgeable staff at a lower rate, thus substantially reducing input costs. 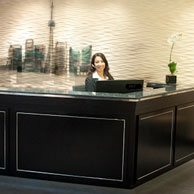 The opportunities for businesses that may be experiencing difficulties in expanding staff due to medical coverage and other proposed benefit costs, could find some relief from these expenses by adding staff in Canada rather that in the U.S.
Why establish your branch office in Toronto? Large and small established businesses looking to open a branch office, or even start-ups looking to establish a presence in Canada, should put Toronto at the top of the list because it’s the largest city in Canada and the fourth largest city by population in North America. Toronto is also home to the headquarters for many international financial institutions and branch offices for international brands and corporations. The University of Toronto, York University and Toronto’s many community colleges provide a well trained workforce in many disciplines. From a logistics point of view, Toronto’s proximity to the “Golden Horseshoe” industrial manufacturing area, its short distance from the U.S. border, and its proximity to both the New York and Michigan border crossings, make it an excellent location for a branch office. Toronto is also a major hub for national and international travel with Toronto’s Pearson International Airport providing air travel and many newly renovated train stations and highways providing access to all regions of Canada and North America.